"Skinny-fied a favorite recipe of mine. Goes great with chili!" Preheat oven to 375 degrees F (190 degrees C). Grease 24 muffin cups or line with paper muffin liners. Mix together cornmeal, flour, baking powder, baking soda, and salt in a large bowl; stir in corn kernels. Whisk together creamed corn, sour cream, water, and egg in a separate bowl; stir into cornmeal mixture until a smooth batter forms. Pour 1/4 cup batter into each greased muffin cup. Bake in preheated oven, rotating muffin pan half way through to ensure even cooking, until tops spring back when lightly pressed, 25 to 30 minutes. 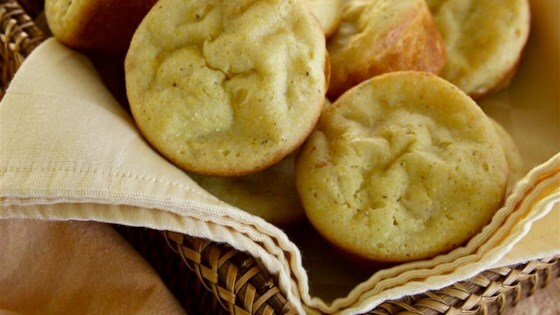 See how to make sweet, moist, and cakey cornbread. Meh. Not a ton of flavor and the flavor it did have seemed hollow. I'd rather eat something with more calories with more flavor and a more robust taste.